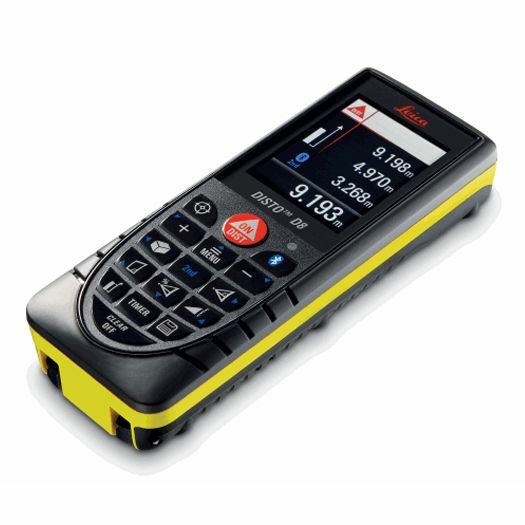 The Leica D8 laser distance meter is a professional distance measuring device for measuring straight line distances, areas and volumes up to 200 meters. Using BLUETOOTH & software ensure that data transfer to pocket PCs and PCs is quick and error-free. The simple way to enter your results into Excel & Word, AutoCAD and other programs for further processing. 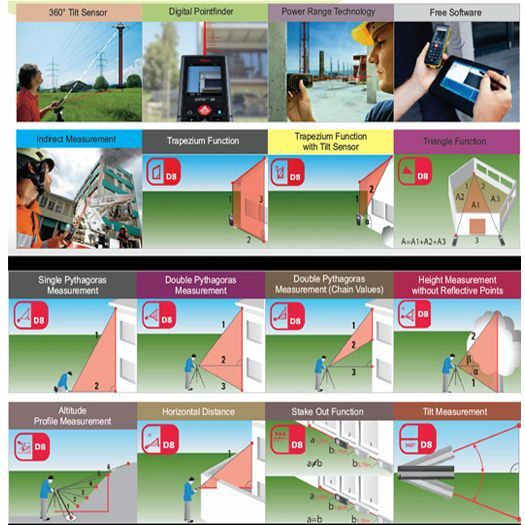 Integral tilt sensor: Using the tilt sensor you can also take indirect measurements. 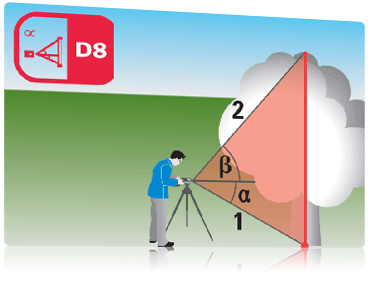 From this the horizontal distance can be derived inspite of obstructions. 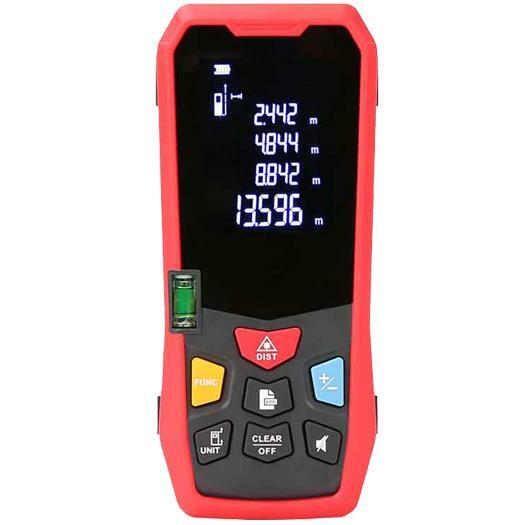 Display in digital point finder mode on Large Colour graphics Display. The high image resolution provides a clear, sharp picture of the target directly on the display. 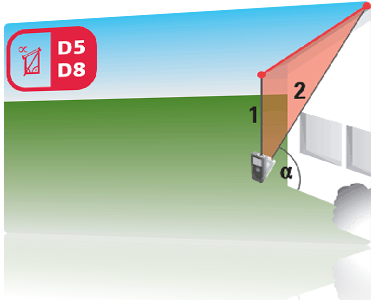 Building or tree elevations that don't provide suitable reflection points can be determined with the dual tilt measurement. Point with the laser to the lower target of the requested height and trigger a distance and tilt measurement. 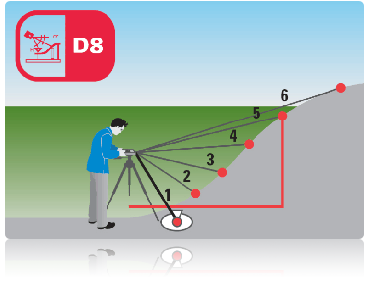 Then direct the digital Point finder on the upper target and carry out a tilt measurement. 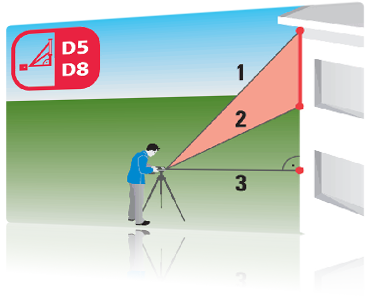 With this function you can, for example, measure a roof slope of a house from long range distances as well. 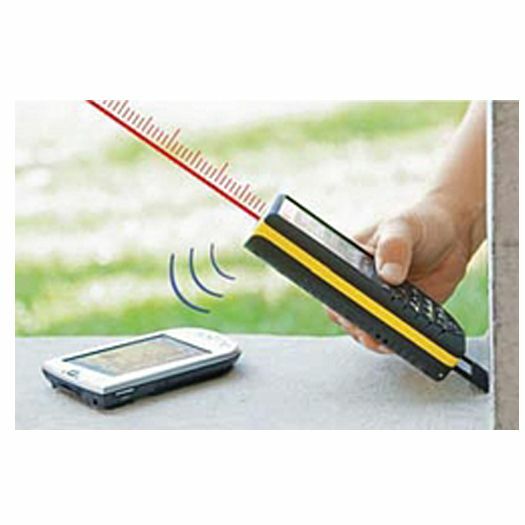 Measure a known reference mark with the device and then measure from each of the relevant altitude differences. When the measuring points have all been recorded in one direction you can then determine a cross-country tread with the measured horizontal distance and the height difference. 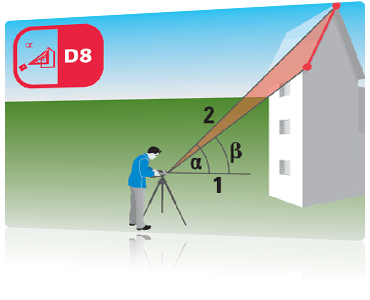 Just two measurements are enough to indirectly calculate the horizontal or vertical distances. 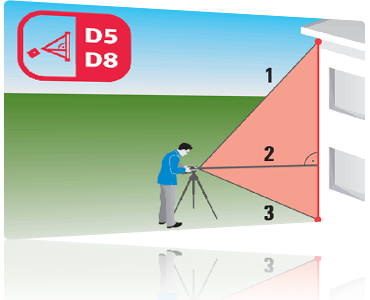 Using a tripod you can measure horizontal and vertical distances. 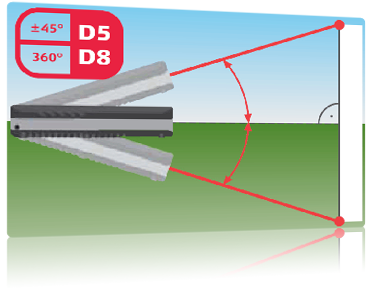 The Leica DISTO™ determines the results for you out of three measurements. 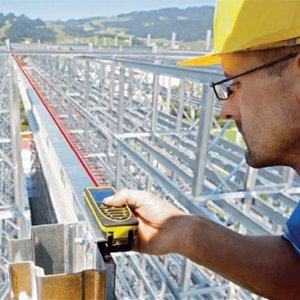 Functions such as minimum and maximum measurement help you find the correct measuring point. With just three measurements, you can also determine partial. 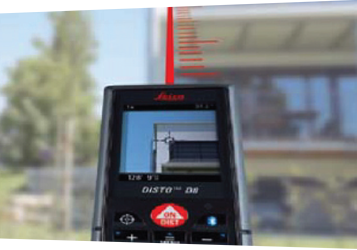 The tilt sensor of the Leica DISTO™ D5 measures inclinations of up to ± 45° and the DISTO™ D8 has a measuring range of 360°. That means with this device even overhead inclinations can be measured. 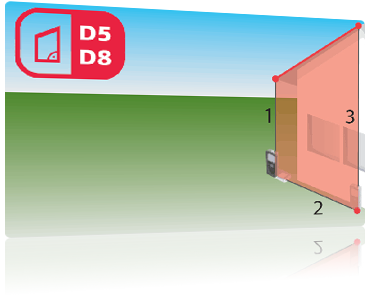 This is especially interesting when determining roof slopes. 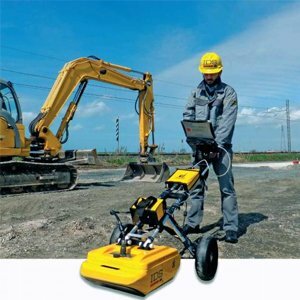 The tilt measurement allows you to determine the desired horizontal distance, even if the object cannot be directly targeted. 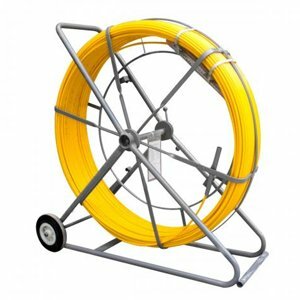 This is particularly useful when obstructions like walls or hedges stand in the line of sight. 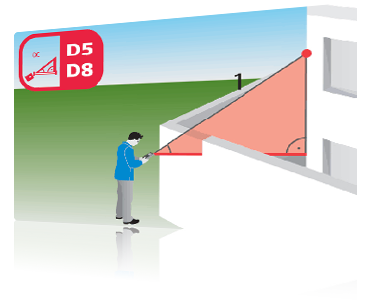 The trapezium function is used to quickly and safely determine roof slopes and frontage areas. 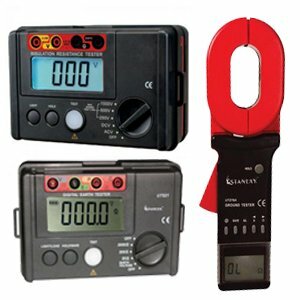 For example, you only need to take three measurements, and the result appears on the display. 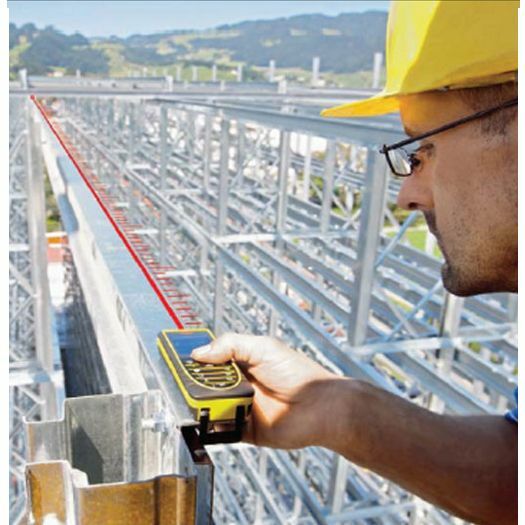 If access to the object to be measured is limited and measurements can only be taken from one position, then this is no problem – thanks to the integral tilt sensor. 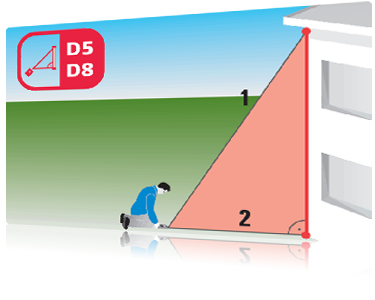 This trapezium function can also be used to quickly and safely determine roof slopes and frontage areas. 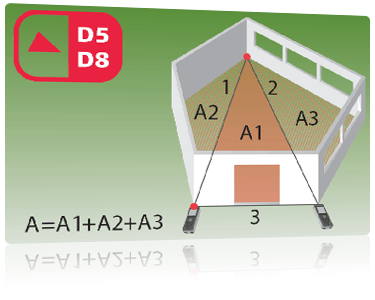 The triangle function helps you quickly and efficiently to arrive at the area of a multi-cornered room. Divide the room into imaginary triangles. Then use three measurements to determine the areas of each of the triangles, which you can add together as you proceed. Finally all you have to do is read off the result. 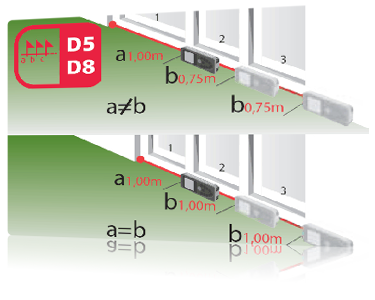 Two different distances (A and B) can be entered in the device and then be used to mark off defined measured lengths. At each measured length, the display shows the current marking distance and a direction arrow. Additionally, an alarm signal starts to ring at a distance of 0,1 m from the next stake out point.